Looking for a clever way to treat guests? Our Berry Cream Pie Dip is a delectable treat made with whipped coconut cream and fresh strawberries, blueberries and raspberries. It is dairy free, gluten free and perfect for dessert or snack. Chill the bowl of a stand mixer in the freezer for 10 minutes. Once chilled, add the coconut cream to the bowl and whip on high speed until light and fluffy, about 2 to 3 minutes. Add the powdered sugar and vanilla extra. Beat for an additional minute, scraping down the bowl as needed. 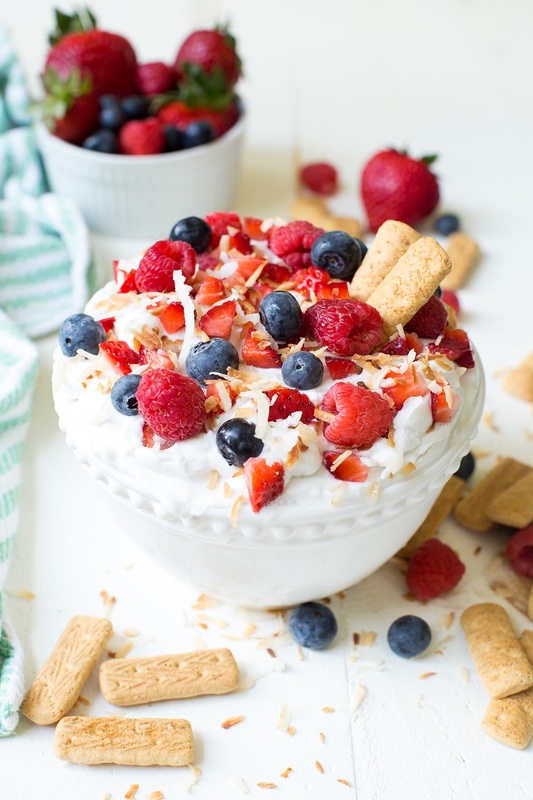 Pour the whipped coconut cream into a bowl, sprinkle with coconut flakes, strawberries, blueberries and raspberries. Serve with graham crackers. Enjoy!